'Casita del Mar', as its name suggests is a 'cottage by the sea', situated towards the bottom of infamous Mallams. The property was built around 150 years ago and is decorated in a mix of contemporary and vintage style to suit all tastes and always with comfort a priority. There is a courtyard for alfresco dining in summer and wood burning stove in winter. Step outside the front door, look left and you will be greeted with stunning views of the sea. A five minute walk down the hill will bring you to the village of Chiswell, stunning rocky coves and the pebbles of Chesil beach. Have a drink outside the famous 'Cove Inn' and watch the sun go down or a short walk in the opposite direction and have a fish supper (fresh fish caught daily from local fishermen). Due to the large volume of items left behind this year, from empty backpacks to dog beds, it is not possible to send them back to you, I'm sorry. I will return gold or silver jewelry. PLEASE DOUBLE CHECK YOU HAVE TAKEN ALL YOUR BELONGINGS WITH YOU. english, italian, io parlo un po Italiano! I live in Weymouth and became the owner of this Portland stone fisherman's cottage in 2006. In the summer of 2009 it undertook a complete refurbishment and has now been transformed into 'Casita del mar' with it's fusion of vintage and contemporary style to appeal to all tastes! Having garden design and interior design in my background I have recently been the owner of a Vintage clothes shop.I have three daughters and two grandchildren! I live in Weymouth (7 miles from Portland) and when the opportunity came up for me to acquire another property I looked first in Weymouth but was uninspired. When it came to looking on Portland I fell in love with the charm of the fisherman's cottages and in 2009 I began the transformation of 49 Mallams into 'Casita del mar' a holiday home. Throughout this transformation I had, what I would want, in mind. I wanted 'Casita del mar' to have a homely feel, a place I would like to spend time in. Portland is very rustic and somewhat remote from the hustle and bustle of Weymouth, the nearest town. I love the quirkiness of the property and that I can stand outside the front door, look left and see the ever changing look and colour of the sea. 'Casita del mar' is full of charm, vintage touches everywhere mixed with the contemporary and with comfort a priority. Winter or summer there is a 'Casita del mar' Portland experience for everyone. Hot summer days and alfresco dining - stormy seas and a log burning stove in winter. There is some parking in the road but it gets used up quickly. There is a free car park a four minute walk away. There is a google map on the dining room table giving you directions. I suggest you park outside the cottage, let your passengers and luggage off, then park. Please note there are a number of steps back up to Casita del mar then passing about 6 houses on the way. It is well served with bus routes to Portland Bill and Weymouth and a local taxi service. Please be aware not to park in front of other people's driveways. They are not happy when this happens as they are not able to get their cars out. They contact me immediatly! There is a reminder note to this effect in the cottage also. You can bring your pet, £15 extra per pet. It is vitally important they do not go upstairs. Please use the stair gate provided. Thank you. 100 percent cotton linen provided. Outside washing line and collapsible airer. Some parking in the road but gets used up quickly. A free car park a three minute walk away. Towels provided. Not for the beach. There are leather sofas in the living room with Freeview TV. DVD player. CD/radio. Wifi. In the dining room there are Books,Games, DVDs and CDs for your use. sugar, tea, coffee, olive oil,salt, pepper, vinegar. All dishes, saucepans and utensils. washing machine. gas hob,electric oven. Pine table and chairs for six. Patio with table and chairs for six. Also terrace with sea glimses. Table and chairs for six. Sea views from the terrace. Golf courses are located in Weymouth, 41/2 miles from Portland. Notes on accommodation: The cottage is suitable for children of all ages but children under 5 should be supervised as there are some steep stairs leading to the top bedroom. There is one step down, from the front door, into the living room and two small steps up to dining room, then one step up into kitchen. Therefore the property may not be suitable for people with mobility problems. If mobility is not a problem then these extra steps all add to the charm of the cottage. Initial basket of logs provided in winter. All other utility bills included in the price of the cottage. There is no smoking in the property. One small well behaved pet welcome during off peak periods at an additional cost of £15 per week. Outside: There is a secluded courtyard and terrace for alfresco dining for six. Cleaning / Towels / Linen / Maid service: All Bed Linen and Towels are included in the price. Please do not use towels for the beach. Step out of the front door to see the sea - or catch a glimpse from the upper outdoor terrace. Delightful. Comfy beds. Wifi works well. Good pub nearby. Handy location from which to explore the whole Jurassic coastline, to the east and west; Chesil beach, and nearby Weymouth. The area around Dorchester, just 13 miles, has some lovely connections to Thomas Hardy (Max Gate, etc), and The Blue Vinny pub in Puddletown is super. But .... the cottage has damp in some areas, which affects the atmosphere (and smell). Two of our party have COPD, and one of those is susceptible to pseudomonas bacterial infections - pseudomonas thrives in damp conditions. So if you're perfectly fit and healthy this is a very nice, quaint place to stay - if you have any lung conditions, I couldn't recommend it. Bathroom and kitchen a bit "tired", but serviceable and well equipped. Good powerful shower (having worked out how to switch it on!) Three of the four light-bulbs in the kitchen light fitting didn't work, so with only one small bulb working it was a bit gloomy for food-prep and cooking. Generally clean and tidy, with a few corners missed by the hoover, and the occasional cobweb. Nothing too gruesome! Terrace catches the morning sun, and the furniture is in good condition - thick overgrowth from neighbouring wall could be cut back in case people need to use the washing line to dry beach towels, wetsuits, etc. Parking is impossible adjacent to the cottage (altho' ok to drop off people/luggage/shopping for two minutes outside) - free car parking areas are about 150 metres away - steep steps and hill up from the car park. Thank you for your 'highs and lows' Review Susan. I always appreciate hearing what worked and what didn't from guests. Firstly I would like to say I always work hard to rectify any problems. It has always been important for me to 'get it right'. It's been a very busy summer with back to back guests.If the previous guest does not highlight to me there is a problem then I don't always get to hear about it. Due to the light nights during the summer no-one had told me there was a problem with the lights in the kitchen, with only one bulb left. As soon as I knew I looked for new light bulbs the week before your stay but I realised the day we spoke that the bulbs had been discontinued. When you arrived I was in the process of getting a new light fitting and organizing an electrician to fit it. It has now been completed but apologise it hadn't been fitted before you came. I have been waiting for the season to end before the builder could go into the cottage and rectify a couple of the walls which you said were damp. The houses in Mallams are noted for this due to the era they were built. It has had extensive damp-proofing but creeps up in other places. We have had a very hot dry summer so the walls were not 'damp/wet' but the paint was peeling off. The builders are now due to go in to rectify this. I understand you had two guests with you who had COPD and so do I along with asthma, allergies and I am the survivor of lung cancer from 2011 with continued lung infections but whilst in the cottage I have never had a problem and this I explained to you during our telephone conversation. I hope it didn't affect your friends stay. The ivy creeping along the wall, I agree needs a very thorough cut-back and that also is on the list as my gardener was never available during the summer so now have someone new. Parking is explained on the website so you would have known. Also there were emails between us about this before you came. A great final summer break at the extraordinary Isle of Portland in the beautiful Dorset! Wow!!!! What a fantastic Review of your stay on Portland Teofana. I am so happy you all had such a lovely time. Casita Del Mar is a great base from which to explore Portland and beyond. 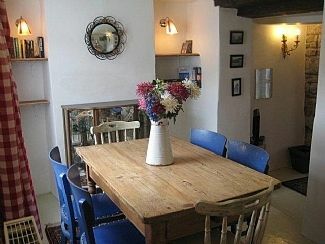 The cottage is full of character, and provides everything you need. Fortuneswell has good pubs and restaurants within walking distance. Portland offers atmospheric walks, the Rodwell Trail excellent traffic free cycling, Chesil Beach good fishing and Castletown great Scuba Diving. We’ll definitely be back next year! Thank you so much Chris for a wonderful Review. 2 of us stayed here but has enough beds for 6 people and is good value for money. The kitchen is well stocked with everything you'll need. Furniture is a bit outdated but the house itself is well looked after. Location was great for us with a 3 min walk to a quiet and beautiful pebble beach and restaurants also in walking distance. Thank you for a lovely stay. Thank you for your positive Review Emily. Just one response! I never saw the furniture as outdated more personally picked vintage/retro pieces!!! I’m not a fan of the new but I believe the kitchen and bathroom should be modern which I hopefully achieved. Once again thank you Emily. Portland is popular for sailing, with nature lovers, divers, windsurfers and walkers with it's miles of coastal and inland footpaths. Chesil beach (on the Jurassic coast) is a five minute walk away. Portland Sailing Academy 10 minute walk away. Weymouth with it's safe sandy beach is 41/2 miles away. Weymouth railway station: 41/2 miles away. Bournemouth Airport: one hours drive away. Heathrow Airport: 2.5 hours drive away. Weymouth Condor Ferries: 20 minute drive away. Weymouth 41/2 miles away - beaches (famous Punch and Judy), shopping, restaurants, pubs, night life. Dorchester 121/2 miles away (county town) Market every Wednesday. Durdle Door, Athelhampton House, Monkey World, Sea Life Centre and lots, lots more within a radius of 20 miles. 'Casita del Mar' is within walking distance of shops, post office, bank, restaurants, supermarket (walk to the top of Mallams, turn right and two blocks away is a Supermarket, open till 10pm every night) local dive and windsurfing sites, also Weymouth and Portland Sailing Academy.